Santa Cruz Surfers Make Coastline A Reserve You may think of surfers as slackers. But in Santa Cruz, Calif., they're city council members and business owners. And they're also conservationists — who just got their piece of the central California coast named a World Surfing Reserve. A surfer rides a wave at Steamer Lane, with the Santa Cruz Wharf in the background. 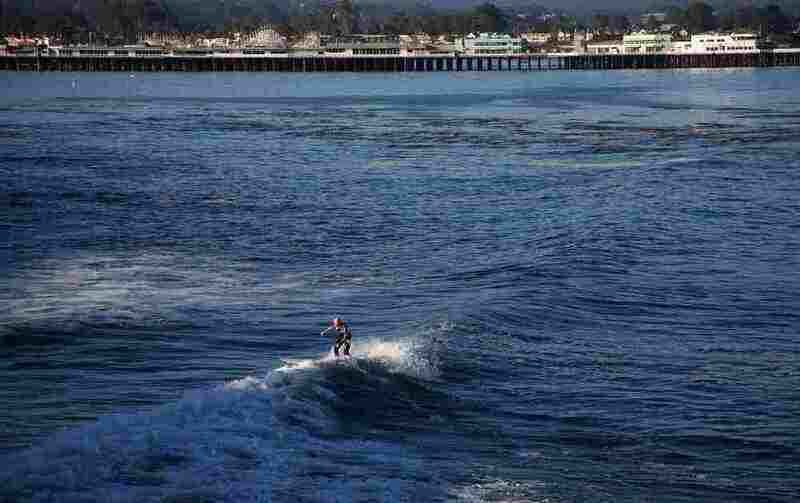 A long swath of Santa Cruz's coast has been designated a World Surfing Reserve. You may think of surfers as slackers. But in Santa Cruz, Calif., they're city council members and business owners. And they're also conservationists — who just got their piece of the central California coast named a World Surfing Reserve. Long before surf music topped the charts and long before surfers had crazy nicknames, surfers have been riding the waves in Santa Cruz. On a recent day, the crowd included "Wingnut" — also known as Robert Weaver — and other surfers. He pointed out some friends: "There's Frosty, there's Boots, there's Fathead." Weaver calls Santa Cruz "the first place that the Hawaiians brought surf back in the 1800s." As the story goes, it was 1885, and three Hawaiian princes were attending a nearby military school. Homesick, they fashioned boards out of redwood and went surfing. That long surfing history, plus the quality of Santa Cruz's 23 surf spots, are the reason surfers, businesses and local government teamed up to get the area's near seven-mile stretch of coast named a World Surfing Reserve. Weaver is a Reserve ambassador. "Since I have been everywhere around the world chasing waves, I still live in Santa Cruz," Weaver says. "So that kind of tells you where it stacks up in the grand scheme. It's not the warmest, it's not the biggest — but it's one of the most consistent waves in the world." One of Santa Cruz's most popular surf spots is Pleasure Point. That's where surfer Dean LaTourette stood up on his first wave as a teen. Decades later, he's on the World Surfing Reserves executive committee. He says the designation is a proactive way to guard the world's best surf spots from threats like water pollution, coastal development and beach closures. "A lot of times, we'll come across these development projects when they are well under way, already have gone through approval processes," LaTourette says. "So World Surfing Reserves is a way to get ahead of the curve." That means in addition to catching waves, surfers may also have to catch a planning and zoning meeting. Since there's no legal protection that comes with being a World Surfing Reserve, the success depends on a local stewardship council. Its job is to identify and address threats to the coast. The council includes public officials, conservationists and representatives from Santa Cruz's multimillion-dollar surf industry. At the O'Neill surf shop on Santa Cruz's east side, the first wet suit created by Jack O'Neill hangs framed on the wall. Sixty years ago, he founded his global water sports company based on the simple idea of finding ways to stay in California's cold waters longer. Brian Kilpatrick handles marketing for O'Neill Wetsuits; he's also on the World Surfing Reserve's stewardship council. He says the company pays close attention to environmental issues like pollution and coastal development. "Anything that's going to affect the ability to get in the water and stay in the water as long as possible is a top priority for us," he says. Kilpatrick says the company's success is closely tied to the preservation of the coast. Weaver hopes other surf towns around the world will also make protecting the coast a top priority. "That's where there is more of a concern," he says, "where maybe it's underdeveloped already, and we can use the experience of what we have here to help protect them." That includes places like Uluwatu, Bali, in Indonesia — where environmental regulations aren't as strict and the pressure to develop is high. It's the next likely surf spot to become a World Surfing Reserve.